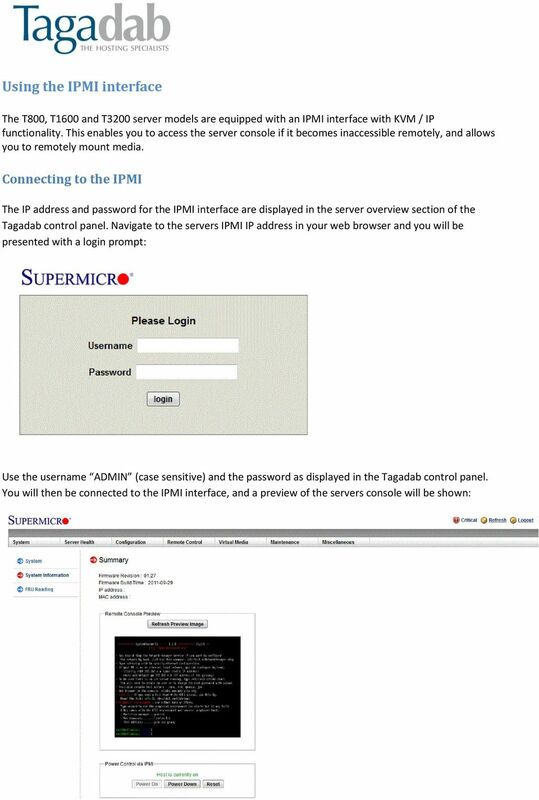 Download "Using the IPMI interface"
2 In this case the server is running our Linux based self-installation / rescue environment. Using the remote console Clicking on the preview image of the console will open the Java based remote KVM. Your browser will need to have the Java plugin installed (you should be prompted for installation if it does not). Whilst the console launches you may be presented with several security messages which you will need to accept for the console to run. Once started you should see a console similar to the one below. From here you can perform diagnostics as if you were sitting at the server console. Your keyboard and mouse can be used as normal, although certain special key combinations (such as CTRL+ALT+DEL) need to be executed from the macro menu at the top of the KVM window. If you have any trouble using other keyboard combinations you can create custom Macros from the Macro menu. 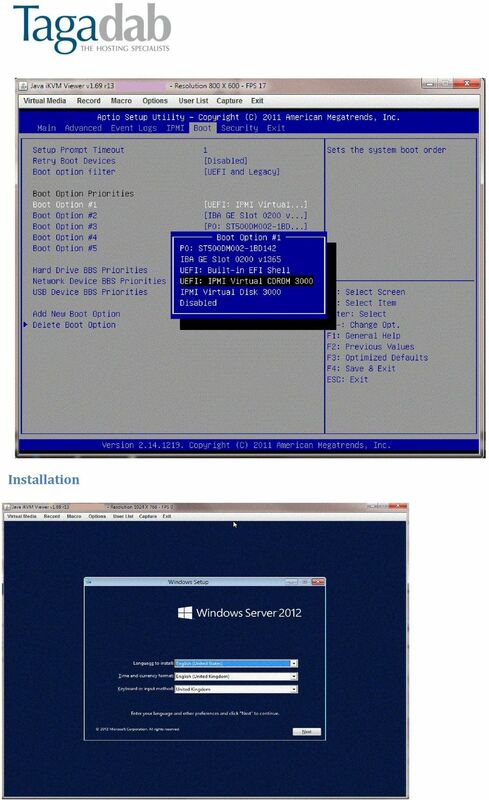 Self-installation via IPMI Customers can perform their own operating system installations on dedicated server models equipped with an IPMI controller. You may want to install an operating system that isn t supported by Tagadab s automated installation process, or customise the partitioning and package selection rather than accept our defaults. 3 To do this you should order a server through the Tagadab shop as normal and select Self Installed OS as the operating system. Our provisioning system will allocate you a server of the correct model, assign and setup a network for you, and configure the IPMI controller so you can access it remotely. You can then remotely mount the installation media to perform the installation. 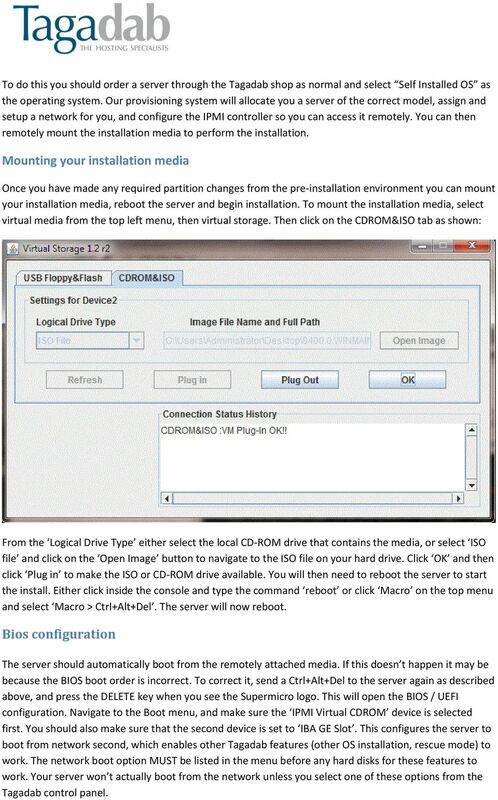 Mounting your installation media Once you have made any required partition changes from the pre-installation environment you can mount your installation media, reboot the server and begin installation. To mount the installation media, select virtual media from the top left menu, then virtual storage. Then click on the CDROM&ISO tab as shown: From the Logical Drive Type either select the local CD-ROM drive that contains the media, or select ISO file and click on the Open Image button to navigate to the ISO file on your hard drive. Click OK and then click Plug in to make the ISO or CD-ROM drive available. You will then need to reboot the server to start the install. Either click inside the console and type the command reboot or click Macro on the top menu and select Macro > Ctrl+Alt+Del. The server will now reboot. Bios configuration The server should automatically boot from the remotely attached media. If this doesn t happen it may be because the BIOS boot order is incorrect. To correct it, send a Ctrl+Alt+Del to the server again as described above, and press the DELETE key when you see the Supermicro logo. This will open the BIOS / UEFI configuration. Navigate to the Boot menu, and make sure the IPMI Virtual CDROM device is selected first. You should also make sure that the second device is set to IBA GE Slot. This configures the server to boot from network second, which enables other Tagadab features (other OS installation, rescue mode) to work. The network boot option MUST be listed in the menu before any hard disks for these features to work. Your server won t actually boot from the network unless you select one of these options from the Tagadab control panel. 5 You can now proceed with installation. Installation will take significantly longer using remote media than it would using local media or our automated installation system. The speed of installation will be dependent on your local internet connection (upload speed especially). You can speed this up by using installation media that only boots the server and obtains the rest of the installation packages from a network source, such as an online repository. After Installation Once you have completed installation, go back to the virtual media page and click plug-out. You can now reboot the server into your new installation. Updates Click to check for a newer version of the CD Press next and confirm the disc burner selection before pressing finish. The SyncBack Management System An Introduction to the SyncBack Management System The purpose of the SyncBack Management System is designed to manage and monitor multiple remote installations of SyncBackPro.